In February-March 2011, almost half of the population of Bahrain rose up to call for their rights to inclusive and representative government, an end to violence and torture by security forces, and democratic reform. At the center of the uprising was the Pearl Roundabout, which would become the symbol of independence and resistance to the security use of brute force against the peaceful protest movement. On the morning of March 18, 2011 the Government of Bahrain demolished the Pearl Roundabout in an attempt to destroy Bahrain’s Tahrir Square and quash the hope of the peaceful uprising. Five years after the pro-democracy movement began in 2011, Bahrain’s human rights situation has deteriorated significantly, with activists, journalists, children, and anyone who expresses dissent being arbitrarily detained, often facing trumped up terrorism charges for “harming national unity” and suffering torture in detention. The political reconciliation process remains stagnant, with the government refusing to engage in a meaningful dialogue with the political opposition that continues to peacefully call for democratic reforms and ensure Bahrain’s majority Shia population has representative governance. 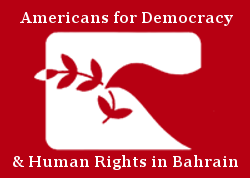 In February 2015, on the fifth anniversary of the uprising, Americans for Democracy & Human Rights in Bahrain (ADHRB) will recreate the Pearl Roundabout in Washington DC to highlight the ongoing struggle for respect for human rights and democratic reform in Bahrain. The roundabout will travel through Washington, along with its own protest movement, to celebrate and create awareness of Bahrainis ongoing calls for democracy. But we need your help. Join ADHRB to help us reconstruct this symbol of peace, democracy, and human rights by contributing to our crowdfunding campaign to re-erect the Pearl Roundabout. Every donation, no matter how small, will help us bring this symbol back and stand in solidarity with the people of Bahrain. Please give $5, $10, $20, $100 or more to help rebuild the Roundabout.